I had the opportunity you test the Sony 50mm F1.8 OSS lens on the Sony NEX-7. This Sony 50mm F1.8 OSS lens is about 75mm in the 35mm equivalent on the Sony NEX-7 with the 1.5 crop factor. That makes this lens a medium telephoto, great for portraits, Close Ups, medium product shots, and some sports, among other subjects. For this phase of the review I wanted to focus on Close Ups. I wanted to use real world images and not take pictures of brick walls and test charts. I wanted to see how easy the lens autofocuses Close Up, how the manual focus override works in real world use, how does the lens sharpness perform in “real life” shots, and what’s the “feel” of the out-of-focus areas (Bokeh). So let’s get to it. 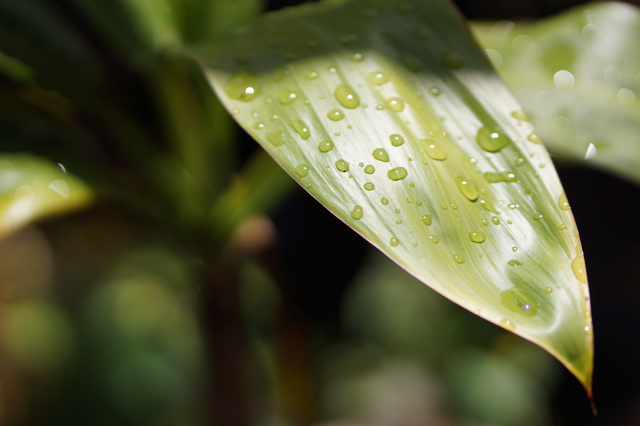 The autofocus speed of the Sony 50mm F1.8 OSS lens is pretty snappy. It is “silent” and with lots of light it snaps right into focus. I did an unscientific focus speed test against my wife’s Canon s95. I call it the “tip of the finger speed test”. Up against the Canon s95, the Sony NEX-7 with the Sony 50mm F1.8 OSS lens wins, but not by a landslide. 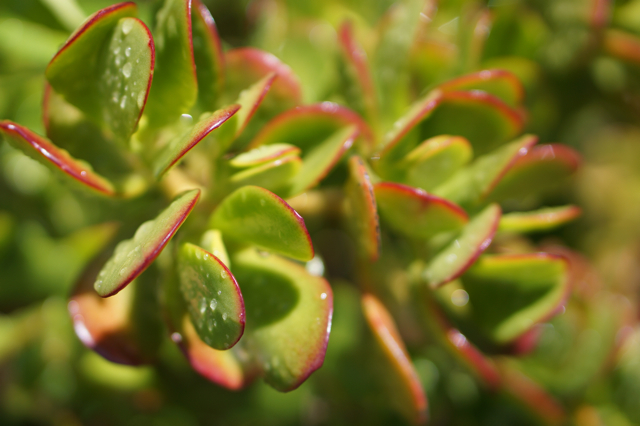 The Sony NEX-7 with Sony 50mm F1.8 OSS has an interesting phenomenon happen with you focus Close Up. I’ve experienced this with other Sony cameras before in which the lens focuses past the subject, then fore of the subject, then snaps into focus. I call it “Hunting Focus”. It does it fairly quickly and after you get used to it happening you soon forget that it even was an issue in the first place. It doesn’t happen every time. When you focus on a “flat” scene it rarely does but when you have a busy scene that has multiple possible focusing points it happens almost every time. It seems like the camera is deciding which focusing point it wants to choose and that’s whats causing the delay. 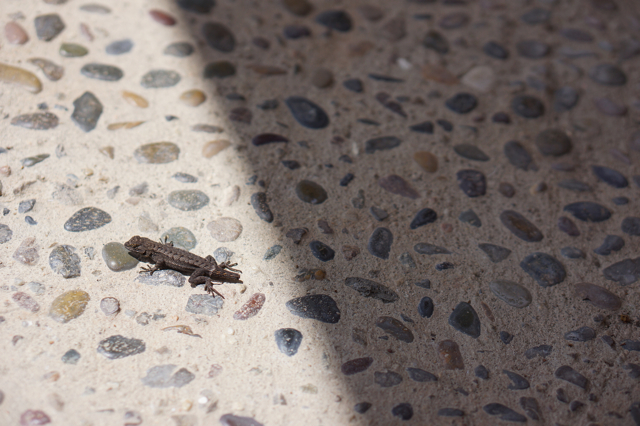 From the images below: in the image of the lizard the focus was very snappy and I was able to catch the little guy sharp as he was running by. 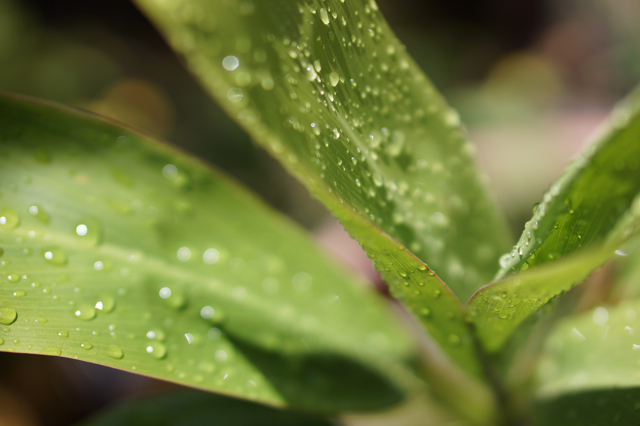 (image relatively flat) In the two images of the leaves, with the water drops on it, the phenomenon of “hunting focus” happened on almost every shot. 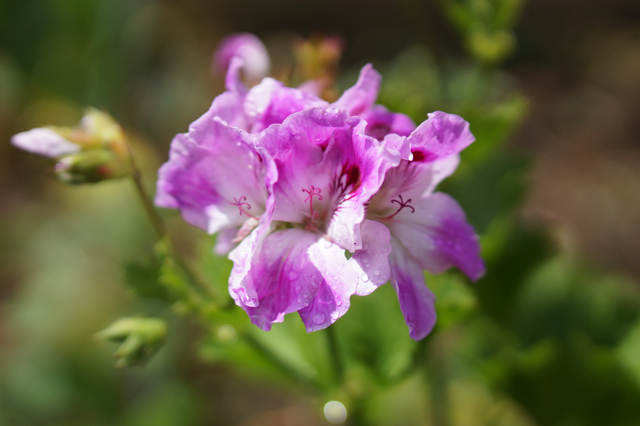 Let me explain what Manual focus override is. When you press the shutter release button “halfway” the camera will autofocus based on the type of autofocus you have set, Center, Flexible Spot, or Multi. If you don’t happen to like the spot that if focused on, with Manual Focus Override you can continue to hold the shutter button “halfway” and turn the focusing ring to “refine” the focus to where you want it. When you turn the focusing ring to “refine” the focus the Focus Assist Mode is activated. This zooms into the center of the frame at 5.9 x. Giving you a closer look, making it easier to focus. In theory the whole process seems a little clunky. In practice, it wasn’t that bad. After using it a couple of times to get used to keeping my finger at “half press”, I really started to value this function. I find myself using it more and more and it’s another one of those “ahh, I really like this idea” moment. There are some minor issues I have. First you have the option to zoom in even closer than 5.9x to 11.7x but you have to press a button on the bottom right of the LCD screen and I found it challenging to “half press” turn the focus ring and use my thumb to press the button to zoom in to 11.7x. All that said, there are many instances where I thought it was invaluable. Getting used to the feature and remembering the turning the focus ring to the right will “refine” the focus closer to you and turning to the left with focus farther really made it faster to use. 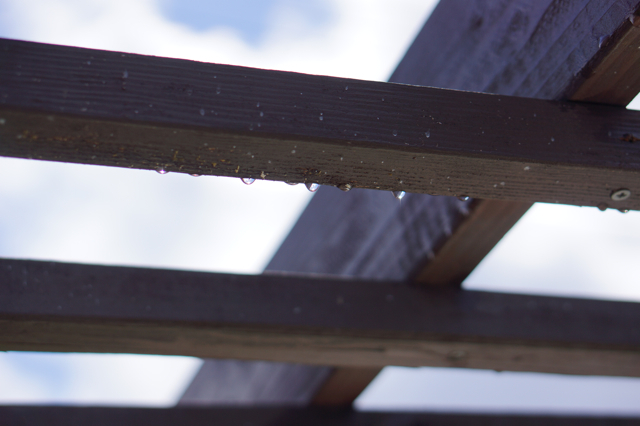 In the image below of the water drops on the Trellis, the original focus point was on the wood but I knew I was shooting at F1.8 and I wanted to focus on the water drops. 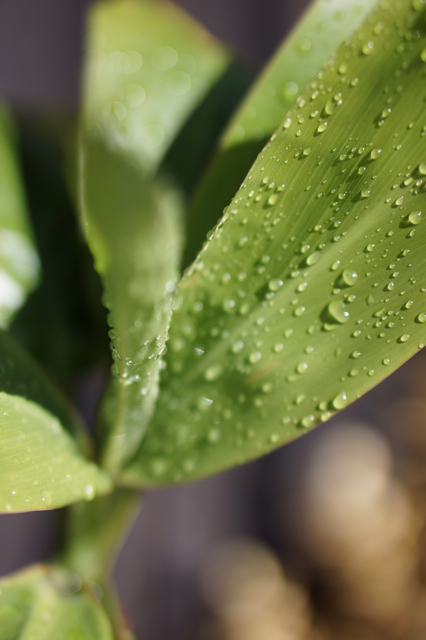 I used the Manual Focus Override and it worked out very well. In the image of the leaf the original focus point was farther back on the leaf and I wanted to bring it forward a bit. Thank you Sony for such a great feature. 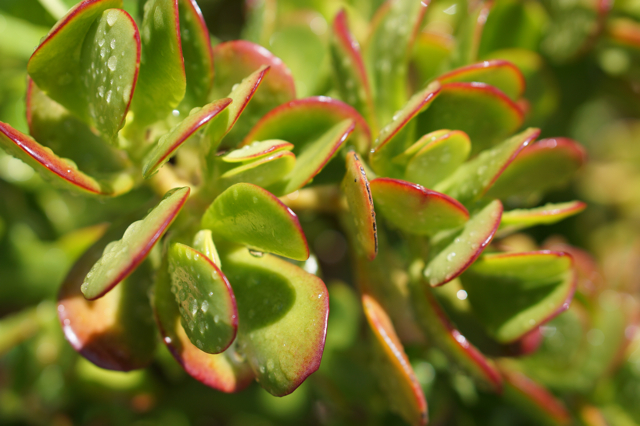 For this part of the review I decided to shoot some plants Close Up that took up most of the frame and used large F-Stops (Apertures) to see how the focus performs at the edge. As you can see from the images below the sharpness is well resolved even to the edges of the frame. I’m not going to shoot a test chart and tell you that there is a 1.5% drop off in sharpness from the center to the edges, because in “real life” there are very few instances in which it really matters. If your image has good composition, impact, and is a strong image no one that really matters will say “I wish it was sharper at the edges”. What I tell my students all the time is, “don’t get caught up in the equipment, just keep making good images”. What I mean by this is that all this equipment that we read about and “Covet” are just tools and if you spend too much time “obsessing” about edge to edge sharpness and not just use the equipment for what it does well then you will be doing yourself a disservice. Images below have plenty of edge to edge sharpness for my tastes. The first image was shot at F1.8 and focus was on the left edge, Second image was shot at F2.8 with the same focus point. Notice how much the Depth of Field travels in just 2 stops. In the grasshopper images I framed the image using the “rule of thirds” placing the grasshopper in the upper right. 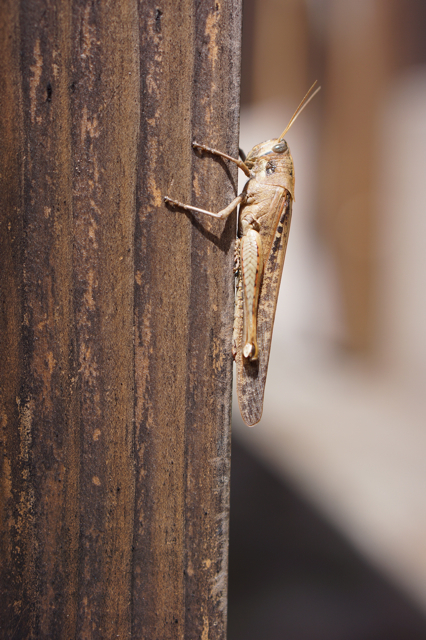 I used the Manual Focus Override to focus on the body of the grasshopper. 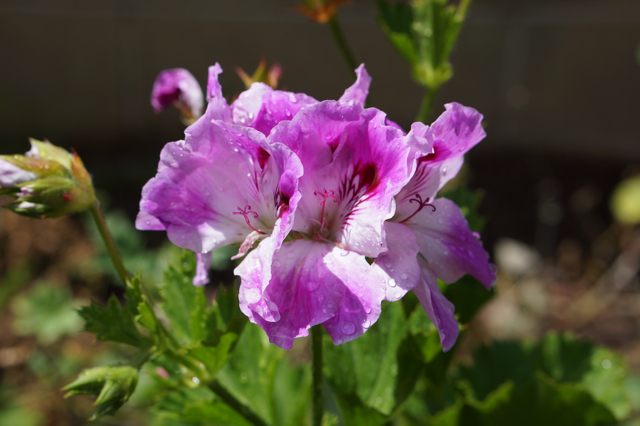 Second image is a cropped image so you can see what great detail this lens can resolve. All this while hand holding the camera. What do you think? Some people judge a fast lens purely on Bokeh. Bokeh is the feeling of the out-of-focus areas of the image. Mostly this term comes up when speaking about lenses with large apertures such as F.095, F1.0, F1.2, F1.4, F2.0, F2.8, etc. The reason most people buy “fast” lenses is for better performance in low light situations as well as the Bokeh. You usually pay a very high premium for this Bokeh because there’s a lot of glass involved. People usually describe the Bokeh in terms such as, smooth, buttery, milky. In my experience the best Bokeh to my tastes usually comes from circular apertures blades. Bokeh is a very subjective thing and is sometimes stated to be a contributing factor to some photographers “look” or personal “style”. So what is the quality of the Bokeh of the Sony 50mm F1.8 OSS? In my opinion the Bokeh is very nice. There are a couple of things that are working for it. The lens is a medium telephoto which usually has better Bokeh then wider angle lenses, and it has circular aperture blades. Creating a smooth and milky Bokeh. 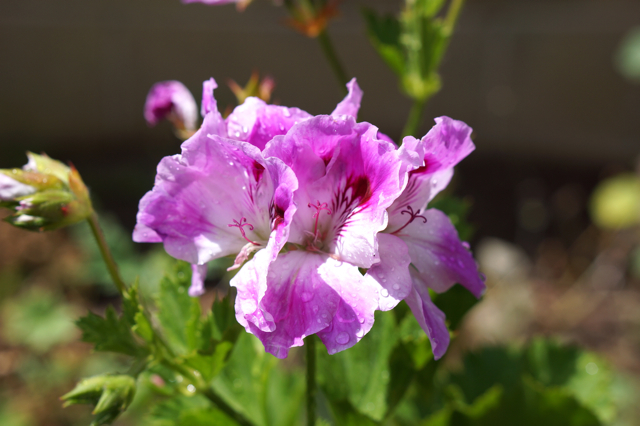 I did a basic flower shot at different apertures to show you the differences. Shooting only a Close Up test on a lens usually doesn’t warrant a decision on whether a lens is worth buying or not, but in this case I feel very comfortable recommending this lens. Here’s my thought process. If you happened to be primarily a Close Up shooter, then based on this review you should be running to the store now. If you are portrait shooter then you will love this lens also, I’ll have another review on portraits with this lens. But you can make certain logical connections from the test here that would be helpful in portrait photography. Here are a couple, Manual Focus Override will work well with portraits. Lets say you focus on the face and the focus isn’t quite on the eyes you can “Refine” focus to the eyes easily. Bokeh, Portrait shooters love shallow depth of field and usually pay dearly for it in terms of money. This lens will be good for more causal shooters also. If you take pictures of your kids at soccer, baseball, or at the park this medium telephoto may be a very good fit. Now the best part?? It’s under $300.00 dollars. WOW!!! What a great deal!! “and for a limited time you can get two for the price of one!! !” No, you don’t get two but the price is rock solid. It’s an amazing value. ***Note*** at the moment it seems like either a lot of people are agreeing with me or Sony has a production problem, but you can’t seem to find these lenses anywhere in the USA and closes date for delivery is 4-7 weeks? *** To tell you the truth I’ve spent more than $300.00 dollars on a lens that did half of what this lens does, even for a toy. Lens baby anyone??? I think Sony has been pretty aggressive on pricing their lenses because they want more people to invest in the good glass (lenses) that they have, so that they will keep “locked in” to the Sony System. To be honest with you if Sony keeps producing high quality lenses such as this one (Sony 50mm F1.8 OSS) and the Carl Zeiss 24mm f/1.8 Wide-Angle Prime Lens, and such great cameras like the Sony NEX-5n and Sony NEX-7, I’d be happy to stick with their system. Keep it up Sony!! Lets see your close up images. Use the Comments area to link to your best close up shots! Please feel free to contact me with how to make these reviews better, or if you have questions or request please contact me about those also. I’d be happy to help. Related Review: Sony NEX-7 – Mom Approved?? Love the pictures… which, admittedly I looked at first. 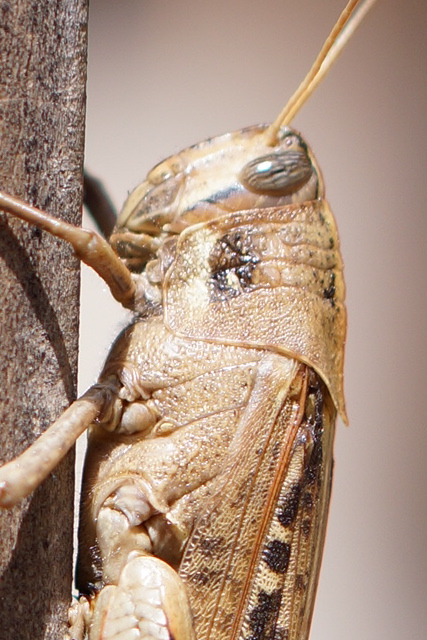 The grasshopper?… kinda gross when looking at it up close. Never knew about thie Bokeh thing, seems like a technical term. Any thoughts on how the OSS works when it comes to taking videos? Thank you Jim for your comment, I will go shoot a sample upload it and post the link. I appreciate your comment! remember everyone I’m open for any requests. Jim here is the link for the uploaded video. http://youtu.be/E4Ei0JESha0 My initial feelings are that the OSS works pretty decently, on par with the competition, i.e. Micro 4/3’s etc. But I feel that the stability gained with the heavier cameras such as the Canon EOS 5d Mark III, and Nikon D800 are better partly because the lenses with IS (image stabilization) are of higher quality and the cost is higher. All things considered, For a $300 lens I don’t have many complaints and it does a good enough job that its worth having other than not. Hope this helps. Please bookmark my site and visit again, and like us on facebook, http://www.facebook.com/photoheadonline If you would like to see anything else I’ll be happy to accommodate. Happy Shooting!! Nice review. FYI, you can press the AF/MF/AEL button to toggle between 5x and 11x in focus assist mode. Much easier to reach than the button on the bottom. Ray thanks so much for your reply. I’ve been trying to toggle with the AF/MF/AEL button but it doesn’t seem to work. It might be user error but this is what I’m doing step by step. I focus on a subject and remain “half pressed” I turn I press the AF/MF/AEL button and then turn the focus ring to initiate the manual focus override with my index finger still at “half press” as soon as I turn the focus ring the magnification comes up for me to fine focus and the option for the 11.9x shows up in the bottom right corner. If I let go of any finger at that point everything disappears and I need to start all over again. I tried just turning the focusing ring to manual override but that doesn’t work. Also tried to multi press the AF/MF/AEL button but that doesn’t toggle between the 5x and 11x. How are you doing it that you can toggle between the magnifications? I would like to find an easier way. Thanks. I appreciate your time to comment. 1. Half press shutter until focus locks. 2. While continuing to half press the shutter turn the focus ring. This should cause the camera to go into focus assist mode. 3. Again still half pressing the shutter, click the AF/MF/AEL button to switch between 11x and 5x zoom. Fine tune focus. Note, it doesn’t matter if the selector is on AF/MF or AEL. 4. Fully press shutter to take the shot. Just to make sure we’re talking about the same thing, this works when I have DMF selected under Menu->Camera->AF/MF Select. Ray, thanks for the step by step. It was user error on my part, I had the default setting on AF so that’s why I couldn’t toggle. oops! thanks again for your comment!! …and I want a B L A C K 50mm lens on a black Nex-7. I completely agree!! Who said camera and lens fashion don’t matter! 😉 Thanks for your reply!! 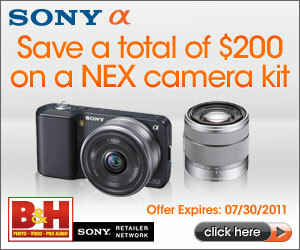 sonyapharumors.com is where I go to get the latest update on Sony Apha and NEX products! They are top notch!